When you choose to get involved in the fight for a better fate of stray dogs in Greece, be prepared. You will see the cruelty of people and you will feel the pain of their victims. Know that you will lose many battles, but the few that you win will make all the difference and will keep you going. You will mourn lives being lost, and you'll celebrate lives being saved. You'll wonder at the cruelty of some people, at the indifference of others and you'll admire the resilience of those fighters who devote their lives to the cause of strays. I've seen all of these. In the last couple of weeks, I've seen one life end, one life get saved and one slipped through my fingers and I beat myself up about it, as I was not quick enough to make decisions. I'll start with the loss. 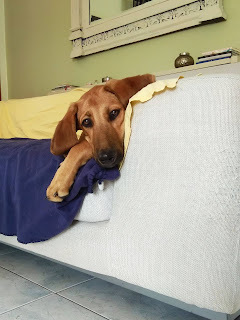 This dog used to live with his family in a big house with a yard right next to a big supermarket in Veroia, a city in Northern Greece, where I regularly shopped. Some time ago, I realized that I never saw the owners of the house, the yard was full of trash and the dog, rather on the chubby side when I first met him, started losing weight. Very soon, my suspicions got confirmed - I learned that the owners had sold the house and the land to the supermarket, and that the two buildings would be soon knocked down and a new bigger store with a big parking lot built in their place. The owners of the house had taken all their belongings when they moved out, but they left the dog behind. They abandoned him and left. Very soon, the place turned into a huge construction site, but the dog refused to leave. He stayed there, amidst the rabble and remains of his old home. Not even the machinery and the noise chased him away. Together with two tireless activists in the area, we made sure that the old boy had access to food and water. But we couldn't shield him from the dangers of his new reality. Some days ago, he got run over by a truck, we've been told by the construction workers. He didn't die on the spot. Injured, he get moved to a safer place, provided shelter and care, but despite the efforts, there was no hope. His hind legs were paralyzed and his body functions got reduced day by day. He passed away a few days after the tragic event. As for his former owners - I have no idea who they are, but I know that you get what you give. RIP, old boy. There are people who mourn for you. That was the life that vanished before its time. Around the same time though, and in the very same place, a life got saved. Toby and his brother, two beautiful puppies with super big ears, got abandoned right outside the old dog's yard, next to the very same supermarket a few months ago. One of them, Toby, was more energetic, more cheerful, very curious about everything happening around him. His brother, Benji, was weaker, and much less assertive, in his own shy way constantly seeking love and attention. After two months of my extensive efforts to find homes and families for them, one of the two puppies, Benji, disappeared. I still look for him - I post on fb, I put up posters, I spread the word - so far, in vain. A couple of days later, I received a message from Athens from a great woman, Tania, interested in adopting one of the two puppies. Since Benji was missing, his brother was the lucky one and he would travel to the new home. It was not easy to find a way to transport Toby from Veroia to Athens, but when there is a will, there's a way. So, a friend of Tania’s drove all the way up to Larissa and I drove all the way down to Larissa, and we met there. Today, Toby lives a happy life in Athens, goes on long walks, sleeps in a comfortable bed and has plenty of food in his bowl. But first and foremost, he is loved and safe. This adoption was a great reason for celebration. The celebration of love and life. It's a story with a happy ending. As for the link with ELT, stay tuned. It’s time for some serious awareness raising. My publication Teaching for social justice: Global education in the English language classroom is part of peer-reviewed Conference Selection based on the IATEFL-Hungary conference 2016.